From National Route 292 (Olympic Road / Shiga-Kusatsu Kogen Route), turn off to the left at bend number 20. After a short while you will see Lake Biwa on the right. Soon after, turn left again at the fork in the road. Keep going for about 1km after this and you will arrive at our car park. *Important! Please note that during the winter season (usually from mid-November to mid-April), the Shiga-Kusatsu Kogen Route between Kusatsu and Shiga Kogen (Yozaka) is closed due to large amounts of snowfall. If coming by car, please note that the roads may be icy or snow-covered, especially between November and May. Please be sure to use snow tires or chains. There is a large parking lot at the end of the road, about 1 - 2 minutes on foot from the hotel, for guests to use (free of charge). In winter, we also have sleds available for transporting your luggage more easily. 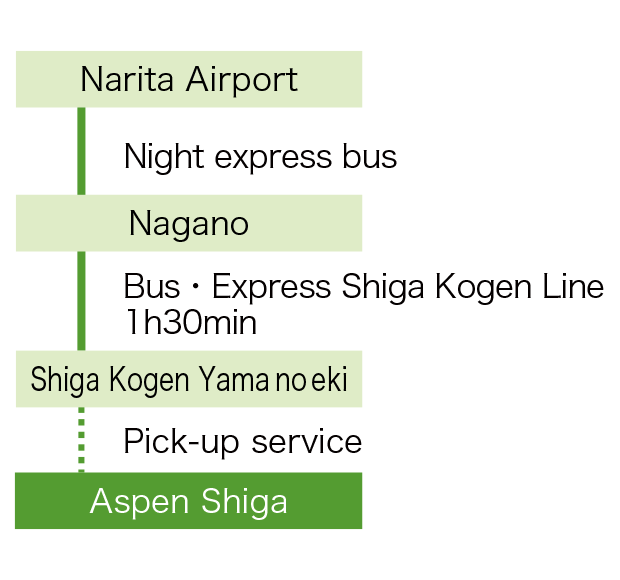 For guests coming by bus, we offer a pick-up service between the hotel and "Shiga Kogen Yama no eki" Bus Stop. Advance bookings are required, so if you would like to use the service, please be sure to inform us of your requested pick-up time when making your reservation. 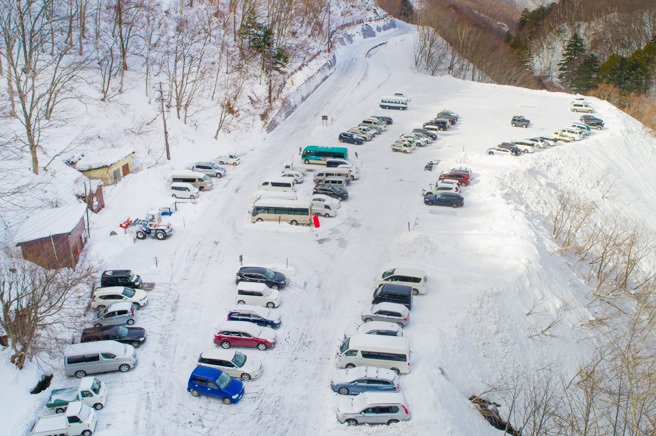 When you arrive at "Shiga Kogen Yama no eki" bus stop, please tell your name and hotel name at the Bus Office. ※ If it is after 18 o'clock, please call +81 269 - 34 - 3700 directly. Proceed to Tokyo Station, from where you can take the Shinkansen to Nagano Station. 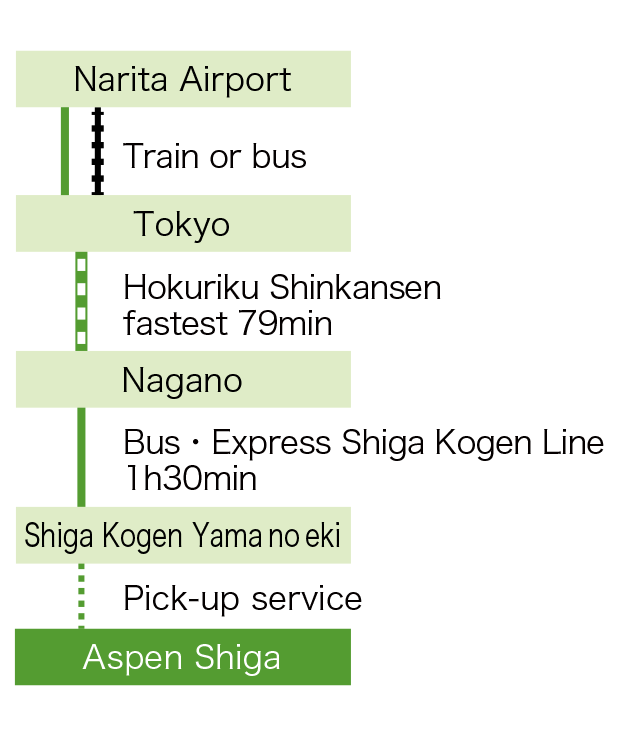 From Nagano station, take the Shiga Kogen Express Line bus (operated by Nagaden Bus) and get off at "Shiga Kogen Yama no eki" Bus Stop. From here you can use our shuttle bus pick-up service (advance reservations required). Take the overnight bus from Narita Airport to Nagano Station. The bus arrives very early in the morning at Nagano Station, so please be sure to wrap up warm in winter. It is possible to book a shared mini-van taxi that will take you directly from the airport to the hotel (advance reservations required). Copyright © Aspen Shiga All rights reserved.